Davis Sullivan is a senior studying economics at Ohio University. 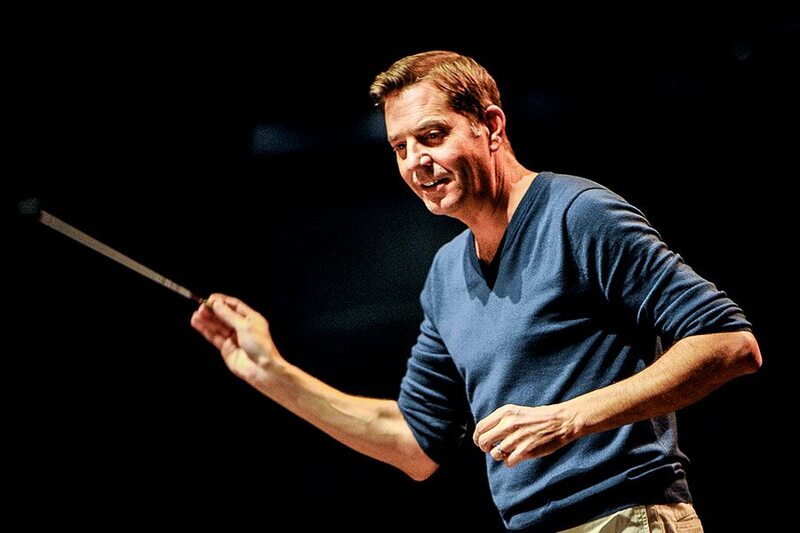 He spoke with fellow Muse alum and New York Pops conductor Steven Reineke. DAVIS: Tell me about your Muse Machine days. STEVEN: I graduated from Tippecanoe High School in 1988, so I was there almost at the very beginning. My time at the Muse Machine was spent playing trumpet. I played in the orchestra pit for several shows, Carousel was one of them that I remember particularly well. Muse Machine exposed me to all these different talents, these different ideas, these different ways of looking at life and the arts. Finally, I found a place where I could connect with people that were like me, at a time when I wasn’t sure if people like me existed. It gave me a wonderful sense of belonging that stuck with me my whole life including some friends from Muse Machine that I’m still friends with. Musically though, Joey Bates was the music director then, and I would get invited to play trumpet at Joey’s productions at WSU, sometimes with the Human Race. I actually played in the pit orchestra for the grand re-opening of the Victoria Theater. I think those opportunities were really important for me as a young musician, just in terms of confidence. I know you have your own arts education programs at the New York Pops. Can you tell me more about that? We have a number of what we call Pops Ed programs that we’re very proud of. We select 20 junior high school musicians to play at our annual birthday gala onstage at Carnegie Hall side by side with the orchestra. We provide music classes to schools where they’ve been cut from the curriculum, and we also have a music residency at the Ronald McDonald House in New York for pediatric cancer patients and their families. These kids are facing such traumatic experiences every day and when I work with them it’s just exciting to see how much they light up when they get to do music as part of their day. You’ve been heavily involved in pops music throughout your career. Why are you drawn to that style more than more traditional classical music? It’s true that I’m classically trained, but my niche seems to be pop repertoire. The variety is so wide open and I like to come up with programming that will be a very entertaining show with some production value, rather than just another concert. I like the immediate connection to the audience and the way that we can draw in audiences from all walks of life, depending on whether I’m doing Golden Age of Broadway or I’m doing Kendrick Lamar’s To Pimp a Butterfly album with Kendrick. I was just about to ask you about that! Are you a Kendrick fan? What was that like? I’m definitely a Kendrick fan. It was a huge deal. It landed me on some ambush interview on TMZ, which was just nuts. The audience was wild; the energy was insane. I’m one of the only guys in the country that has delved into hip hop with orchestra, something I’m very proud of. A couple years ago we did Nas’s Illmatic album all reimagined for him and a symphony orchestra. And then three days later I was working with Steve Martin playing bluegrass!